I am a director primarily of devised theater productions, working with ensembles over the course of a year or more (or less) to create original performances. My productions often bring together different performance languages (dance-theater, clown-theater, circus-theater). As both theater-maker and audience member I enjoy the unexpected ways in which narrative (of some kind) emerges from shifting performance forms and logics. I also love provoking different methods of generating material, as well as encountering varied assumptions about how rehearsals work (as each performance form comes with distinct studio practices). Currently I am co-creating/co-directing (with Julia Rhoads) Roominghouse, with the Chicago-based dance-theater company Lucky Plush Productions, which will premiere at Steppenwolf's Theatre 1700 in November 2017. In summer 2017 I'll be stage directing Third Coast Percussion's Paddle to the Sea. And earlier this year, I wrote and directed Quest, a circus-theater production at The Actors Gymnasium, loosely based on Tolstoy's The Three Questions. Other productions include stage directing Wild Sound, composed by Wilco's Glenn Kotche for Third Coast Percussion, with performances at the Museum of Contemporary Art (Chicago), Metropolitan Museum of Art (NYC), National Forum of Music (Wroclaw), De Doelen (Rotterdam); and co-creating/co-directing (with Julia Rhoads) The Better Half and The Queue, both of which received a National Dance Project Award and a National Performance Network creation fund award ('12 and '14). Presenting venues include Museum of Contemporary Art Chicago; Spoleto Festival USA (SC); CRASHarts at the Institute of Contemporary Art Boston; Dance Cleveland; Flynn Center for the Performing Arts (VT); ODC (CA); and Maui Arts and Cultural Center. I was a co-founder of the Chicago-based physical theater company 500 Clown, where I co-created/directed 500 Clown Macbeth, 500 Clown Frankenstein, 500 Clown Christmas and 500 Clown and the Elephant Deal. 500 Clown shows performed in Chicago at Steppenwolf Theatre Company and Lookingglass Theatre, among others, and toured throughout the US, receiving an Association of Performing Arts Presenters Ensemble Theatre Collaborations Grant, and a Presidential Fellowship in the Arts at University of Chicago from 2005-08. 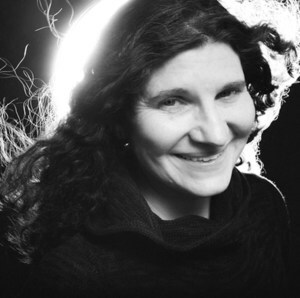 Other directing credits include Damon Kiely's The Revel with the House Theatre of Chicago; Redmoon's The Elephant and the Whale, with Chicago Children's Theater (with Frank Maugeri); Redmoon’s Hunchback at New Victory Theater (NYC) and Rockefeller Memorial Chapel at the University of Chicago; and Float with About Face Theater. Prior to turning to directing, I toured nationally and internationally as an actor with NYC’s Elevator Repair Service. 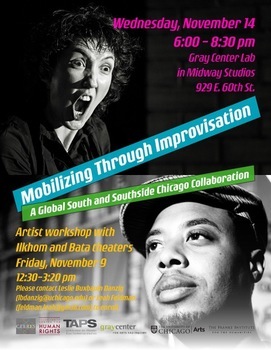 From 2011 – 2016, I was the curator of the Gray Center for Arts and Inquiry at the University of Chicago, a forum for experimental collaborations between artists and scholars, and prior to that, I was a lecturer in Theater and Performance Studies at the University of Chicago. I received my BA from Brown University and PhD in Performance Studies at Northwestern University and trained in physical theater at Écoles Jacques Lecoq and Philippe Gaulier. This project stages an improvisational collaboration between local electronic musician Brother El from the south side of Chicago with actors and musicians from Ilkhom and Bata theaters of the post-Soviet south, Kazakhstan and Uzbekistan.